A young woman slaps an elderly man in frustration. Apparently, she has a deeply held political conviction. He disagrees. So she reaches and out strikes him on the face. Instantly, he responds with a blast of mace to her eyes, causing her to turn and stumble away. The facts are clear. The man was minding his own business and the young lady—angered by his indifference to her political message—strikes out in frustration. It’s all on film. But that doesn’t matter. Not one damn bit. The video in question is widely circulated on political sites all over the internet. For some, it is clear evidence that Donald Trump is a racist, homophobe who hates women and minorities. 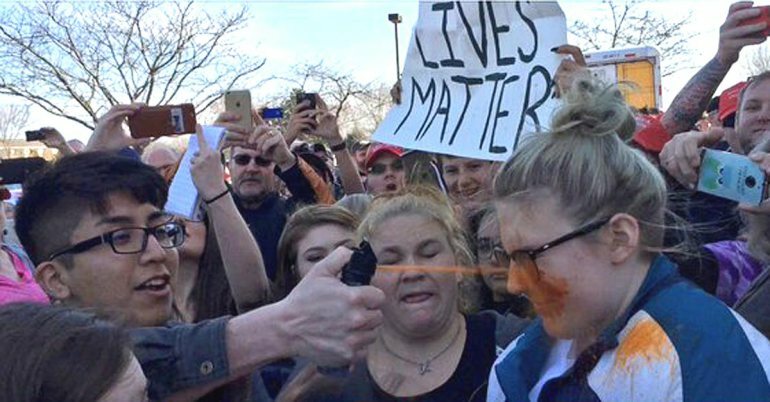 Because this happened at a Trump rally, and that’s proof enough. In a case like this, facts don’t matter, because facts, wherever they don’t conform to political ideology, are racist. For others, it's clear evidence that some people on the Left are unhinged and have long since obliterated the demarcation line between reality and ideology. Wherever the two conflict, reality must be set aside in favor of certain political ideas. Babies aren’t babies, for instance, they’re fetuses, which means baby in Latin, but who speaks Latin, anyway, so it’s not much of a problem. By changing the meaning of words, you can change the way people think. Killing a fetus isn’t killing a baby, because it’s a fetus, you see. And, if the word “Fetus” isn’t demeaning enough, call it a blob of cells. That will be sufficiently dehumanizing to justify killing it. Whatever “It” is. I can only imagine the many symbolic slaps that I might be receiving as I write this for suggesting something so heinous. Not the baby killing part, but the notion that it’s a baby instead of a fetus. Everybody knows that a moose breeds moose’s and a dog breeds dogs, a cat breeds cats, and so on and so forth, it’s only humans that breed non-human babies…..fetuses, I mean. Sorry. Oh, how the slaps descend like rain, washing away the pain of misogyny and hatred. Yes, as a man, a creature of low standing, I am guilty of sins against women just by virtue of my existence. That, my fellow Americans, is what the Left has come to in this once great country. And no, I don’t mean it was great because men, in particular, White men, held all the cards. Although, that’s how some far-Left feminists (and other pretend-scholars) see it. Select your evidence and take a stand. "This message was brought to you by the party for a more progressive America."